Staff photo by Tim Barber/Chattanooga Times Free Press The Tennessee Aquarium River Gorge Explorer turns hard-to-port as it passes the Pinta replica ship as it approaches Ross's Landing on Thursday. The Nina and Pinta are in town until Nov. 2, and tours of the boats will be available from 9 a.m. until 6 p.m. each day. 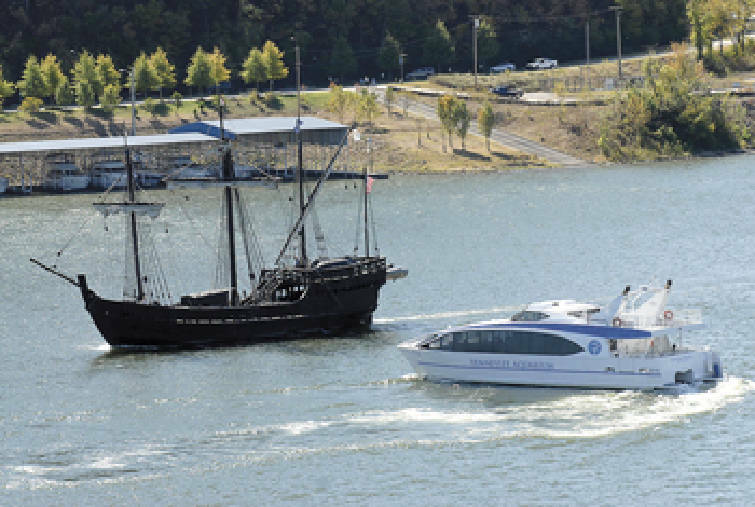 A crowd along Chattanooga's riverfront watched Thursday as history sailed under the Olgiati Bridge and up the Tennessee River. Children and adults saw replicas of the Nina and Pinta, two of the ships that Christopher Columbus sailed to the New World in 1492, silently dock near the city's River Pier. "Whoa," many exclaimed when the Pinta fired off a fake cannon blast. "I think they're really cool because they sort of look like pirate ships, and I really like pirates," 8-year-old Hunter Landreth said from the pier. Downtown's permanent aquatic residents - the Delta Queen and Southern Belle riverboats, the Tennessee Aquarium's River Gorge Explorer and a Chattanooga Duck - were all nearby to greet the new visitors, with the Belle playing "Oh Susanna" to commemorate their arrival. The Nina and Pinta will be docked until Nov. 3, with the ships being open to the public from today until Nov. 2. The Nina, the smaller of the two ships, was built in Brazil from 1988 to 1991 with the same technologies that existed in the 15th century. It was assembled to be the same size as the original that sailed across the Atlantic Ocean from Portugal. The Pinta's construction, which took place from 2002 to 2005, was a little different, said Senior Capt. Morgan Sanger. "Being a much larger ship and some problems in Brazil, we had to use more modern woodworking tools to finish this one," said the 59-year-old. Each ship has a crew of about six, Sanger said, with some switching out from port to port. The ships traveled to the Scenic City up the Tennessee River from Guntersville, Ala., with prior stops in Huntsville and Florence in Alabama. This is their third time in Chattanooga and, after they leave, they will venture to Knoxville before heading back south toward the Gulf of Mexico for the winter. "It's an adventure," said 60-year-old seaman Barry Young, who on Thursday was celebrating his 10th day as a crewman for the ships. Young said he and his fellow crew members are aboard the ships almost all the time, even while docked. "It's our home 24/7," he said. "We cook on the ship, we sleep on the ship, and [we] try to maintain the security." But, he said, there is leave time to enjoy Chattanooga, and the crew rented a hotel room for showering. While history might insist that the third ship in Columbus' fleet, the Santa Maria, should be joining the fleet, Sanger said that wasn't going to happen. * When: 9 a.m.-6 p.m. daily through Nov. 2.